All of our omelets are made with three extra large grade AA eggs & served with fresh fruit salsa, our seasoned Red Bliss potatoes, sliced vine ripe tomatoes, homemade grits or oatmeal. All omelets are served with toasted whole wheat bread. Start with ham, sausage or bacon and choice of Swiss, American or Cheddar cheese and one vegetable (tomato, spinach, onion, peppers, mushroom or jalapeno). Ham, applewood smoked bacon and sausage topped with our homemade gravy. Slow roasted pork with onions, cilantro, avocado, chipotle sauce, roasted corn, black beans, BBQ sauce, sour cream and salsa. Sauteed Spinach and onions with mushrooms, diced tomatoes and a trio of roasted peppers and Boursin cheese. Crispy applewood smoked bacon, mashed fresh avocado and cheddar cheese. Ham, onions and a trio of peppers. Slow roasted brisket, chopped with a trio of peppers, onion and potatoes, grilled and served with two eggs and your choice of side. 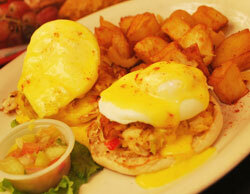 Homemade crab cake topped with two eggs and our “made from scratch” hollandaise sauce. Ham, pork sausage & bacon pieces over red bliss potatoes & shredded cheddar cheese. Topped with two eggs to order, covered with our homemade country gravy. 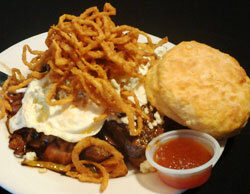 Includes fresh baked biscuit & homemade apple butter. Grilled chorizo sausage, grilled jalapenos, peppers, onions, tomatoes, black beans, corn and Pepper Jack cheese with two eggs to order and topped with enchilada sauce. Drizzled with Chipotle Cream. Free range chicken, bacon bits, mashed avocado, diced tomato, cheddar and Jack cheeses over potatoes topped with two eggs, enchilada sauce and drizzled with Chipotle Cream. Scratch-made meatloaf topped with spinach, mozzarella cheese & roasted red peppers over Red Bliss potatoes. Served with gravy & two eggs to order. Chilled Greek yogurt topped with fresh berries, granola, Florida honey. Served with a fresh baked muffin of the day. Made fresh daily with whole milk and topped with brown sugar and raisins. Fresh berries and seasonal fruits. Multi-grain Toast topped with Avocado Mash, EVOO, Lemon and Sea Salt topped with 2 eggs basted and served with Fresh Fruit. Fluffy egg whites, fresh tomatoes, mushrooms and spinach wrapped in a tortilla. Served with fresh fruit and a side of salsa. 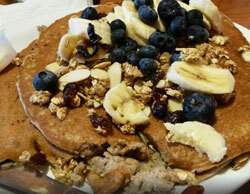 Grilled whole wheat pancakes are an excellent source of fiber with whey protein added. 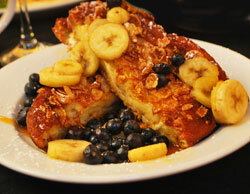 Topped with fresh blueberries, banana and granola. This is a must have! Our freshly-made fritter batter, full of blueberries, cooked to a golden brown and placed in a paper sack with sugar and cinnamon. 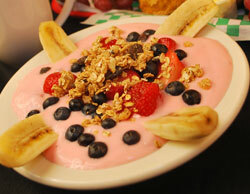 We shake it up at your table and serve them with strawberry yogurt for dipping. All of our Eggs Benedicts are served with Hollandaise sauce, our seasoned Red Bliss potatoes, sliced vine ripe tomatoes, homemade grits or oatmeal. Poached eggs on top of a homemade crab cake made from lump crab meat with homemade Hollandaise sauce. Perfectly poached eggs with Canadian bacon and fresh homemade Hollandaise sauce. Poached eggs on top of house baked toasted honey wheat bread, tomato slices, spinach, peppers. Topped with homemade Hollandaise sauce. Two potato pancakes, homemade tomato-bacon jam, two poached eggs and avocado topped with homemade Hollandaise and diced bacon. A homemade freshly-baked biscuit topped with fresh sausage patties and poached eggs, topped with sausage gravy and freshly-made Hollandaise sauce. Two eggs, two pancakes, two bacon slices or a sausage patty with Red Bliss seasoned potatoes. Two extra large grade AA eggs cooked to order, served with your choice of seasoned potatoes, sliced tomatoes or fresh homemade grits and your choice of biscuit or toast. Burrito stuffed with chorizo sausage, eggs, Pepper Jack cheese, trio peppers and sautéed onions, topped with enchilada sauce, drizzled with Chipotle Cream. Served with salsa, sour cream and home fried Red Bliss potatoes. One scratch-made buttermilk biscuit topped with homemade sausage gravy & two eggs any style. Served with seasoned crispy Red Bliss potatoes. Two eggs to order with ham and Brie cheese on a croissant with Red Bliss potatoes. Two eggs scrambled on our panini bread with cheddar, American or Swiss cheese and potatoes. Crispy potato pancakes topped with cheddar cheese, crumbled bacon, green onions, diced tomatoes and 2 eggs served with a side of sour cream and home-baked wheat toast. Grits topped with shrimp, cheddar cheese, onions, tomatoes, bacon and pepper trio in a cream sauce. Egg-dipped challah bread, stuffed with strawberry jam and cream cheese, rolled in corn ﬂakes and served crispy with warm syrup, whipped cream and fresh strawberries. Challah bread dipped in almond French toast batter & rolled in Captain Crunch pieces. Topped with fresh strawberries, blackberries & sliced bananas. Finished with powdered sugar & whipped cream. Challah French toast stuffed with cream cheese and fresh bananas, topped with fresh blueberries sautéed in a sauce of butter, brown sugar, cinnamon and dark rum. 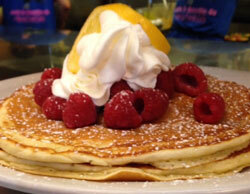 Try our “newly famous” pancakes, mixed with fresh lemon and ricotta cheese and “you’ll never have plain pancakes again.” Moist, ﬂuffy pancakes topped with powdered sugar, whipped cream and a lemon twist. A stack of homemade buttermilk pancakes. Fresh made wafﬂe with a light dusting of powdered sugar and warm syrup.